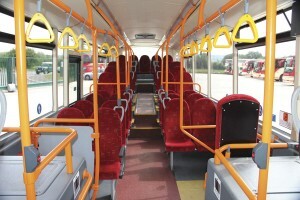 The UK 12m single deck bus market is not as large as it once was, with midibuses and extended versions of midibuses claiming the dominant share of total single deck sales. 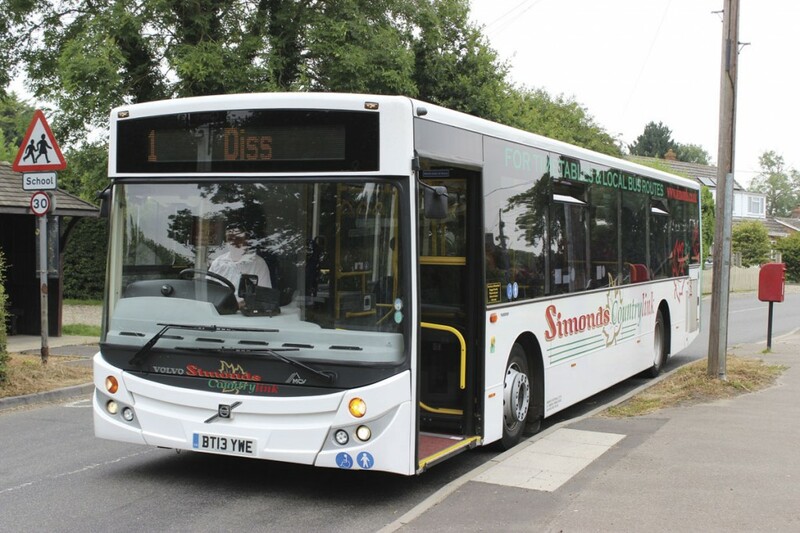 Despite this, there are still operators who want to run something they see as heavier duty and among them is Simonds of Botesdale, now based in a modern depot in Diss, whose latest bus acquisitions are a trio of 12m MCV bodied Volvo B7RLEs. MD, Martyn Simonds and Engineering Director, Adrian Tant, told me all about them. 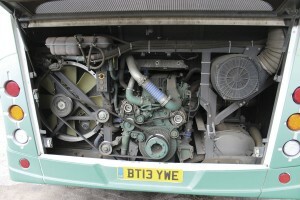 The B7RLE was introduced to the UK market in 2003 and has featured successive Euro3, Euro4 and Euro5 generations of the seven-litre Volvo engine along with ZF automatic transmission. It was already available elsewhere in Europe prior to 2003 but had not been previously offered in the UK because the team here originally thought that the rear saloon arrangement required to surmount the engine would not be acceptable to UK operators. When it became evident that other manufacturers were offering solutions it saw as no better, Volvo introduced the model, initially in conjunction with Wrights. In total 1,976 have been registered to date with only a couple still to be sold with the best year for sales being 2005 when 341 took to British roads. It is only relatively recently that Volvo teamed up with MCV to offer both double and single deck models featuring the Egyptian manufacturer’s bodywork. 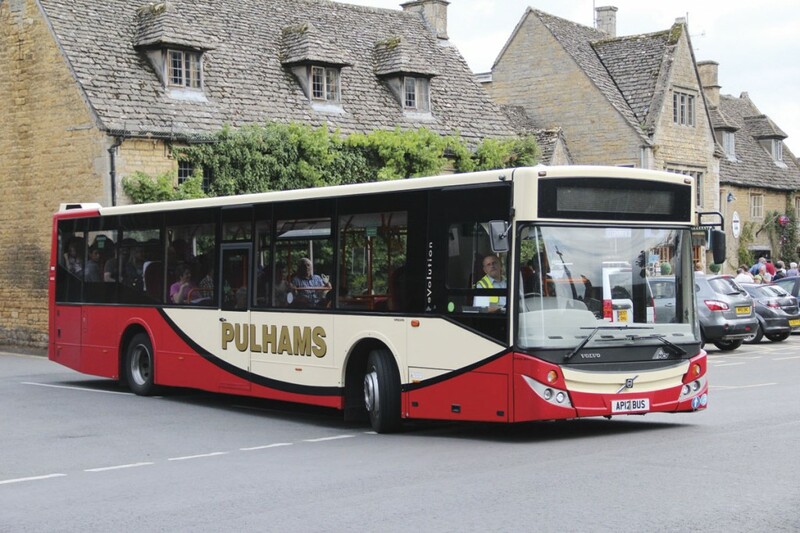 The first significant batch of double deckers, including open toppers, was taken by London based Golden Tours, while the first MCV bodied B7RLEs were a trio supplied in April 2012 to Pulhams of Bourton on the Water in the Cotswolds. MCV already had experience supplying single deck bodies on Dennis, MAN, VDL and Mercedes-Benz chassis and the product was already generally well regarded for its strength and durability. The driveline combines the in-line Euro5 Volvo D7E 7.14-litre engine with the ZF Ecolife 6AP1400B six-speed fully automatic gearbox. Delivering 290hp (213kW) at 2,100rpm, the D7E produces 1,200Nm of torque at 1,050-1,650rpm. The front axle is a rigid beam unit with stabiliser, kneel and ferry lift while the rear axle is Volvo’s RS1228B unit. Other elements of the specification include: ZF power steering, the Volvo BEA2 electrical system, disc brakes with lining wear indicator and control, a 330-litre fuel tank and a stainless steel silencer. MCV designates the 12m long product the C123RLE, offering it in four different variants. 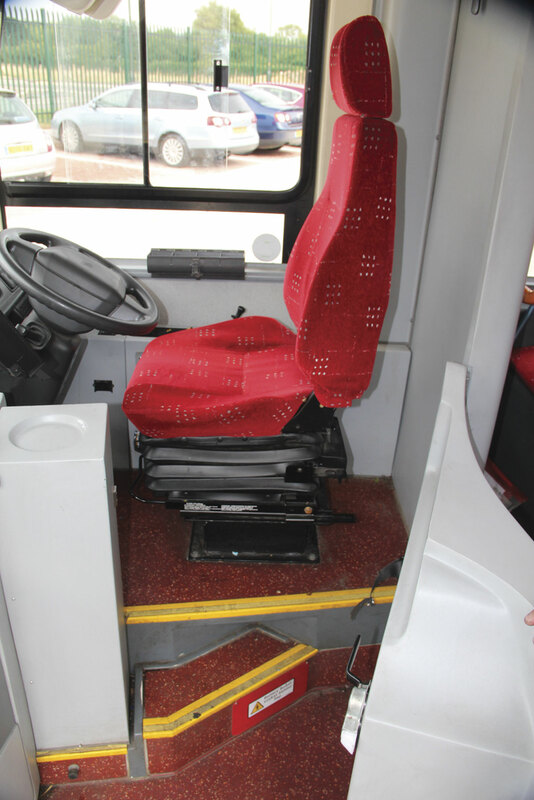 Simonds’ buses are single door 44 seat buses with nearside wheelchair bays, though a 41-seat single door option is also offered with an offside buggy bay in addition to the wheelchair bay. 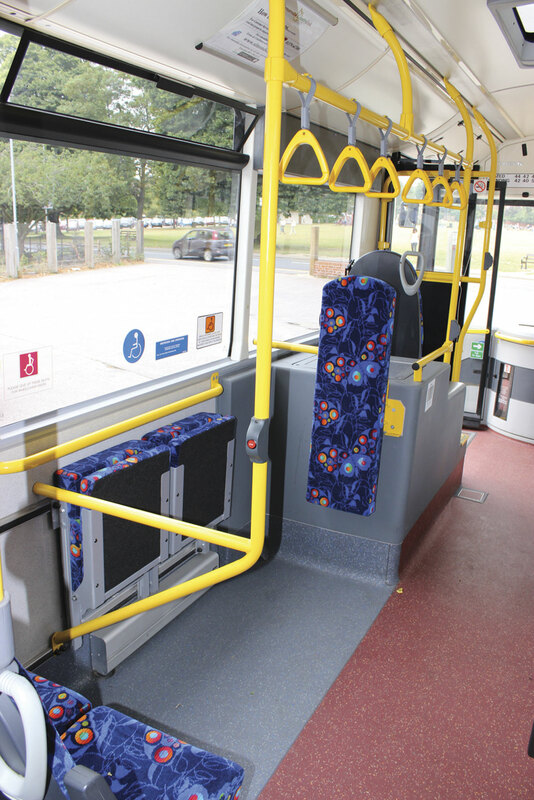 Also offered are two dual door specifications, one of which is specifically designed for TfL contracts with the wheelchair bay opposite the centre door and a maximum of 37 seats. 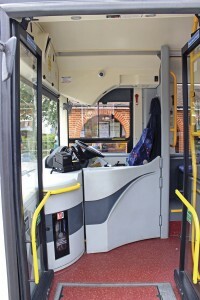 The other dual door option maximises standee capacity and has only 31 seats, all but the two singles on the forward face of the front wheel arches located at the rear of the bus beyond the centre door. The frame is of Cromweld 3CR12 stainless steel and the panels are aluminium, the lower ones detachable. The front panels, rear panels and the roof skin are GRP as are the separate corner sections and the three part bumper assemblies. Glazing is bonded 4mm glass. The electrics are a 24volt Intellitec multiplex system. Simonds specified an optional Synectics T800 eight camera CCTV system. Simonds operate a 47 strong fleet of which 17 are buses. 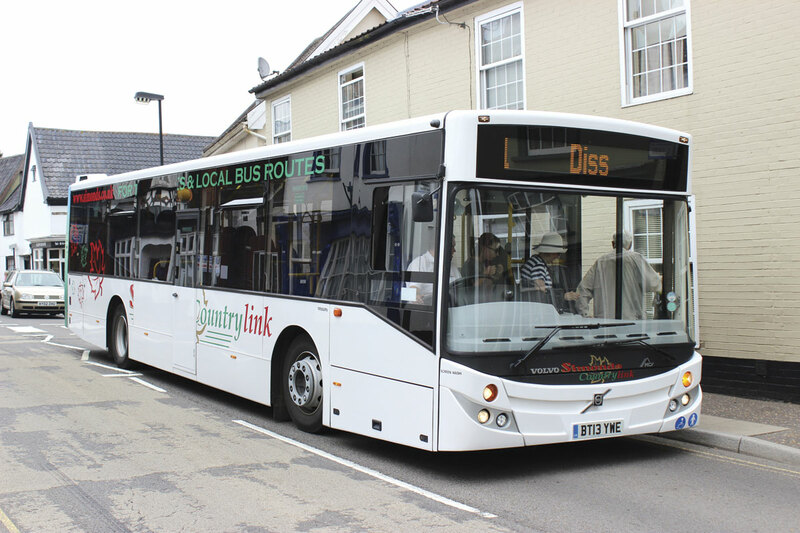 Their requirement was for buses to use on the relatively rural 1 and 2 services between Diss and Norwich. The 1 service traces its history back to 7 November 1966 when Simonds started operating a rail replacement service in the post Beeching era. The MCV Volvos are a far cry from the ex Maidstone & District Harrington Contender bodied Commer Avengers used to launch the route. 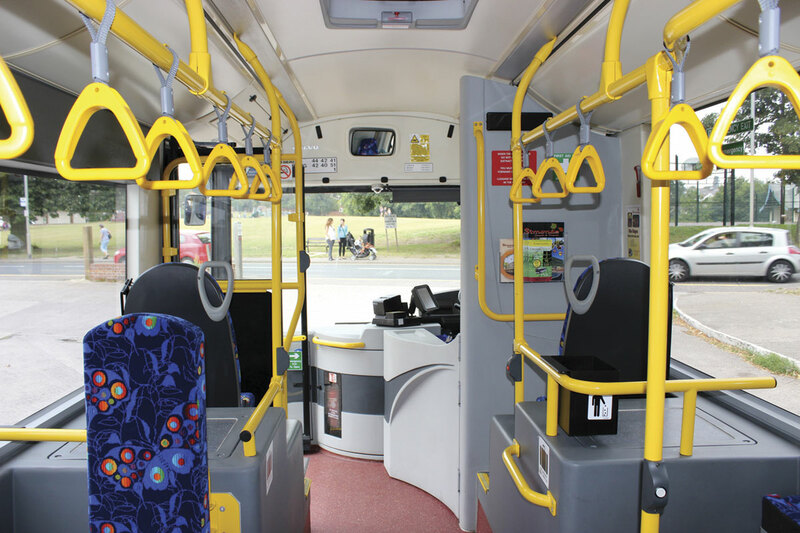 Buses tried before a decision was made included a Scania OmniCity, a secondhand Optare Versa, an Optare Tempo, a Wright Streetlite DF and an ADL Enviro200. They had previously operated a pair of very early Enviro300s for five years that weren’t very successful, as well as a secondhand Cummins powered Optare Excel withdrawn and scrapped recently. The B7RLEs aren’t the only Volvo buses in the fleet. 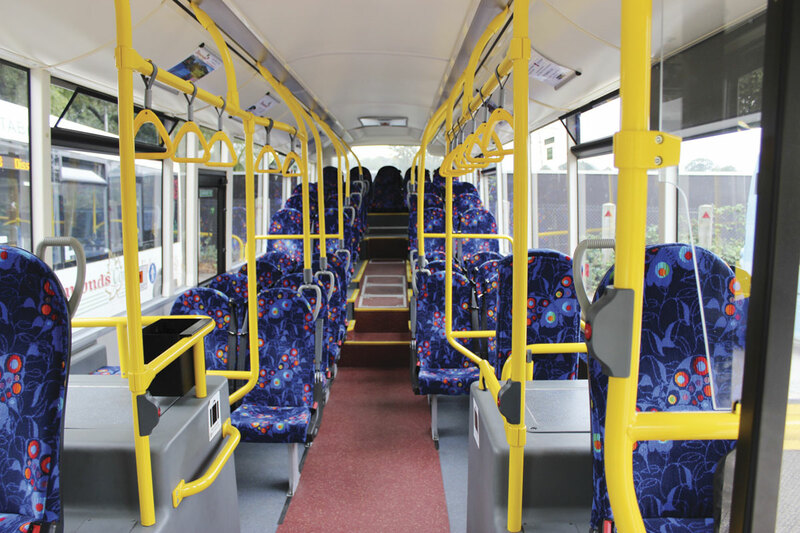 There is also a 2000 Alexander ALX300 bodied B10BLE that was bought as a spare bus but is used every day because of the unreliability of the Primos. 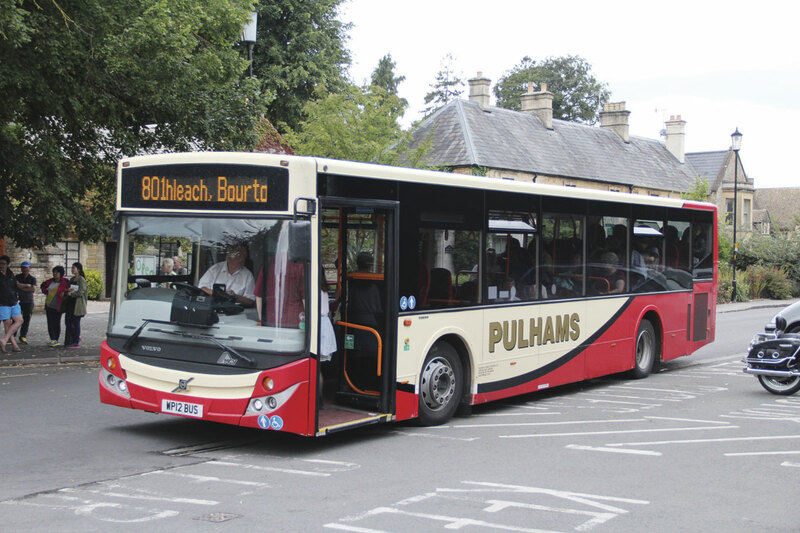 In comparison, the bulk of Simonds’ coach fleet is Volvo, though a number of the latest additions are MAN and the latest new purchase was a 63-plate Neoplan Tourliner. The Volvos include seven B12Bs, the newest an 08-plate and 13 B10Ms, the majority of them with Van Hool bodies. ‘We have had a few MCV issues with water leaks round the hopper windows, one of which became detached. They came out and rectified it on site and there’s been no problem since. There were also a few rubber seat rail infills missing when they were delivered that MCV supplied and fitted for us,’ said Martyn. 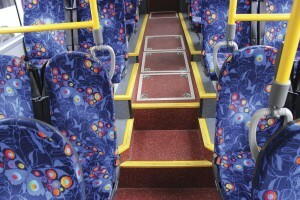 The decision to go for three-point belts on all of the fixed seats was taken because during school terms two of the three perform a school contract linked in with their stage carriage commitments. ‘A good thing about MCV is that it has the two roof hatches, which gives a flow of air in the saloon. You don’t get that with hopper windows. 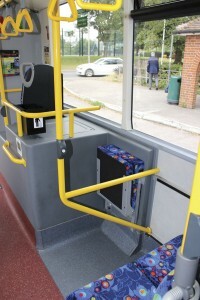 I don’t know whether there are other buses with them and it doesn’t make or break it for me but it helps,’ said Martyn. Adrian said maintaining the Volvos is ‘quite simple.’ They are on a five week regime. ‘We could go to six but it gives us a safety margin,’ he said, adding, ‘there has been nothing untoward on parts. We’ve not had to wait for anything’. 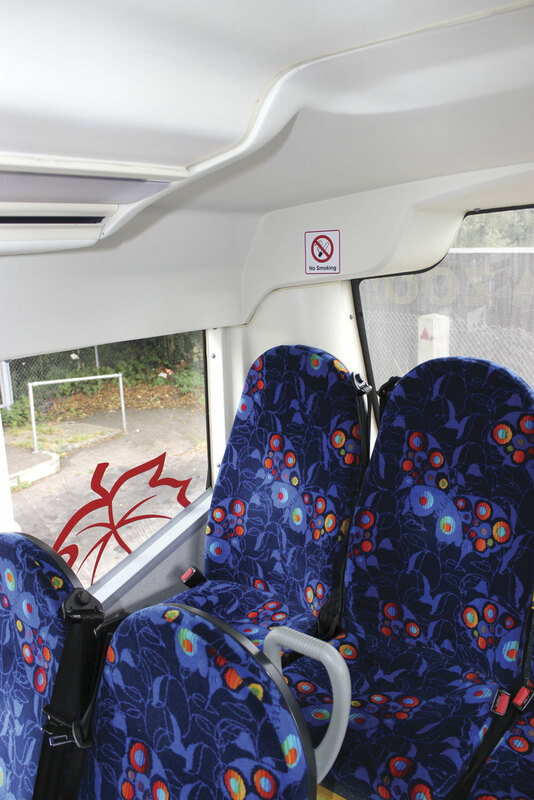 With a bright patterned blue moquette, bright yellow stanchions and step edgings, red aisle floor covering, grey under-seat flooring and most of the interior panelling in white, coupled with large side windows and transparent roof hatches, the interior is bright and welcoming. The roof is relatively low at the rear though not uncomfortably so and there are a number of under-seat steps towards the rear of the saloon, though only two from the flat saloon floor to the rear sunken sloping aisle. There is a manual flip over ramp at the entrance. It may not be as neatly designed as some other products with regard to corners where cans and other litter can be left, but it is practical and appears to be hard wearing. In line with the regulations, the emergency door is in the low floor section on the offside and this was finished in white on the interior side, early examples having been finished in black. In terms of fuel economy, you can judge for yourself their performance as all fuel usage at Simonds is closely monitored. After a year in service and 45,289 miles, one of the 13-plates has achieved 9.60mpg, while the other has covered 43,996 miles and managed over half a mile further for every gallon with a figure of 10.12mpg. 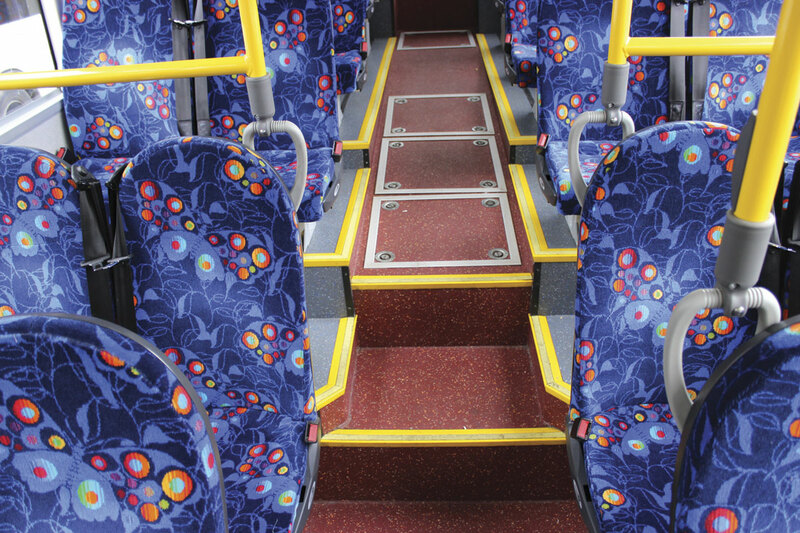 The latest 14-plate bus, which took to the road on 14 March this year, has covered 18,043 miles so far and is following in the tracks of the other with 10.05mpg. For this aspect of the evaluation I asked members of the team at Simonds what they thought. He thought there was plenty of room in the cab, and though they could have done with being bigger, felt the mirrors were good. Asked specifically about comfort they agreed they were comfortable. Very few used the seatbelts provided, though an older gentleman was an exception. He told me he thought it was ‘a bit rattly, especially on a long journey,’ quickly adding that ‘the roads round here are terrible.’ Someone else said the ride was hard, though I thought it was pretty good. I mentioned earlier that Pulhams bought the first three B7RLE MCVs, which were also their first low floor buses as they had previously used high floor coaches on their 26 mile 801 commercial service running six days a week between Moreton in March and Cheltenham via Stow on the Wold, Bourton on the Water, North Leach, Andoversford and Cheltenham General Hospital. 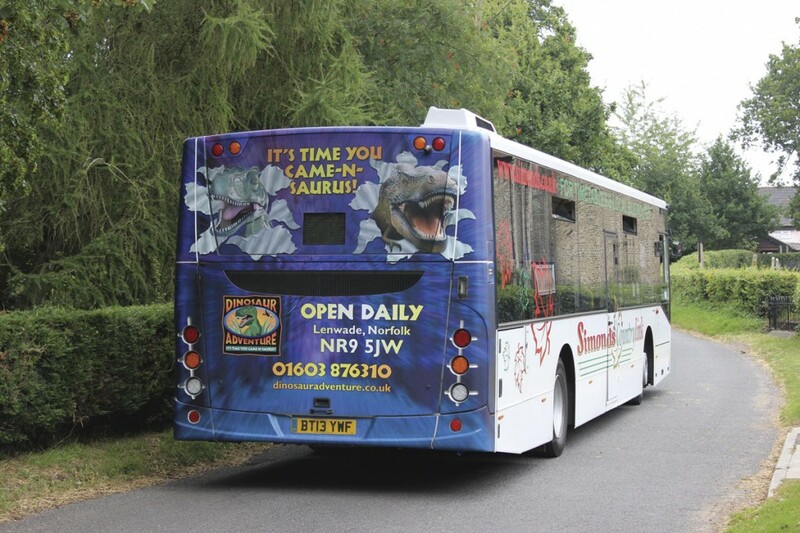 On earlier visits to the company I had asked Proprietor, Andrew Pulham and Fleet Engineer, Chris Adams about their reasons for buying them and experiences with them. In truth, the vehicles have not been without their issues, most of them electrical. After about a month in service, a pattern started to emerge whereby at least twice a week one or other of them would cut out and then go into limp home mode. Repeated visits to the local Volvo agents did not resolve the matter and a point was reached at which Andrew was fed up and let the Volvo management know of his dissatisfaction. 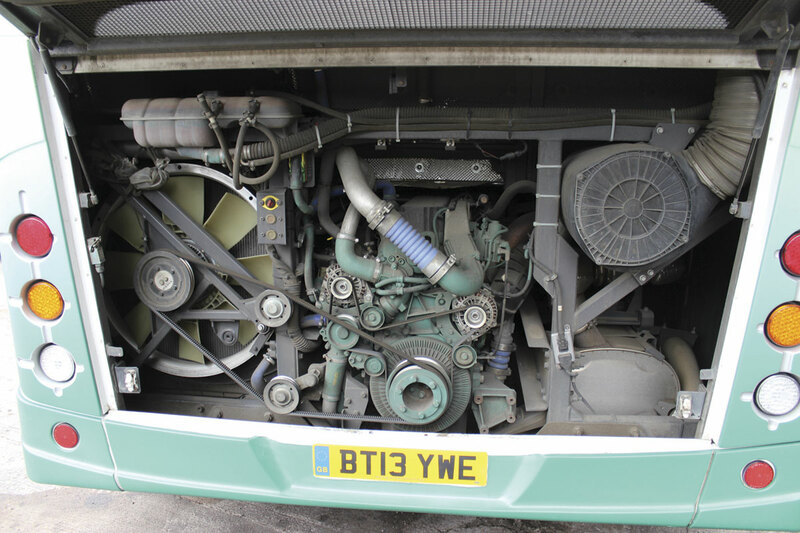 Ian Wallace, Volvo Bus Aftermarket Service Manager – UK & Ireland, acted straight away and arranged the loan of a demonstration B7RLE Wrightbus while each of the trio went in turn to Wales and West’s Swindon depot for the installation of complete new wiring looms from front to back. ‘That was in June 2013 and they haven’t missed a beat since,’ said Andrew. 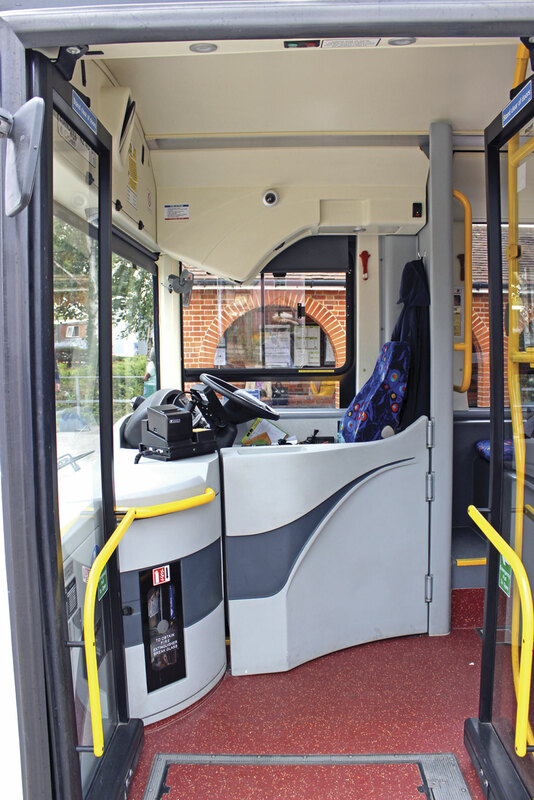 One of the buses suffered damage to the offside including the windows broken in the two bays beyond the emergency door when it was hit by a skip lorry. ‘It wasn’t off the road long. It happened on a Friday and we had both replacements fitted on the Monday by National Mobile Windscreens,’ said Chris. What the MCV lacks in style it makes up for in solidity and a lower up front cost. 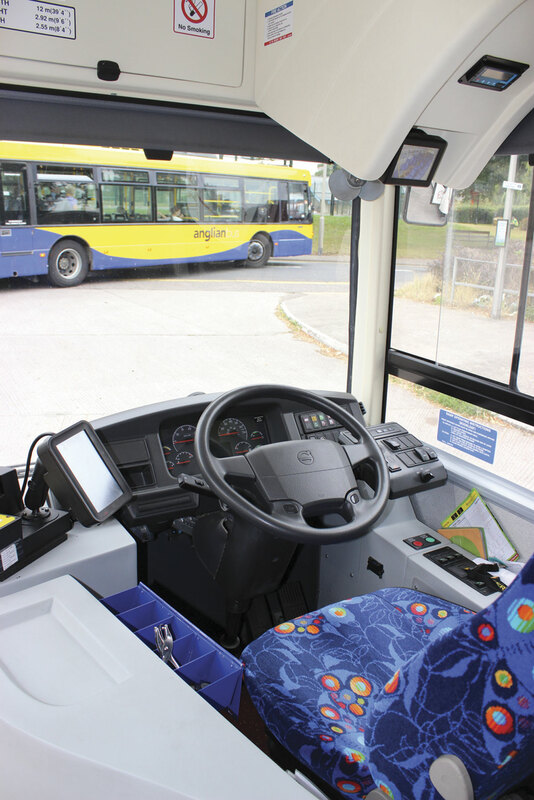 Volvo may not enjoy quite the position they once held in the UK bus market but their products continue to provide customers looking for a strong, reliable and well supported product with what they need. If there are issues, and most vehicles encounter them, especially when they are early examples, it is the way they are sorted out that it is important and both manufacturers have shown they do not walk away.